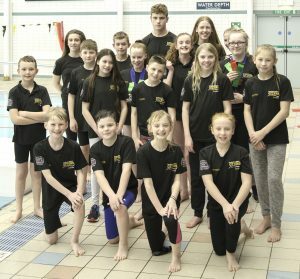 Saturday 17th March 2018 saw an impressive 47 Otters head up to Kendal to compete in an open meet hosted by Ulverston Swimimg Club. For many of the younger swimmers this was their first taste of competing in an open gala and they did not disappoint. They approached all their races with a great attitude and from the looks of it, they had a very positive experience. Our 9 year old girls sets the bench mark– Lucy Adamson(9) taking gold in the 100m IM, 50m Breaststroke, 50m Freestyle and 100m Backstroke, plus gold in the 200m IM, silver 100m breaststroke, silver 50m backstroke, silver 100m freestyle and finally bronze in 50m fly – IMPRESSIVE ! Phoebe Park who was in her first ever open meet took 5th in the 100m IM. Other 9 year old girls just starting out were, Daisy Mapp and Magdalena Szarek, who have now logged great times to start them on their competitive swimming journey. The 9 year old boys did well and starting with the 50m Breaststroke we saw George Fox get his first ever gold medal, in his first ever open meet ! George then went on to be placed 5th in the 50m Freestyle – well done George ! Jacob Dugdale was next up to receive a gold for his highly impressive swim in the 50m Freestyle with a time of 38.03, then in the afternoon session he took silver in the 100m freestyle and lastly a gold in the 50m fly ! – could he be following in the footsteps of his big brother, Tom !? 10 year old girls – Charlotte Collinson had a great morning taking silver in the 100 IM, 5th in 50m Breaststroke, then stormed in with a gold in the 50m freestyle with a jaw dropping time of 34.61. Following that, she took silver for her 50m backstroke, gold for 100m freestyle and gold for 50m fly ! Eleanor Henderson took bronze in 50m Breaststroke and also did well in 100m IM and 50m Freestyle and took a 5th spot for 50m backstroke. Kayleigh Cragg came in in 4th position in the 50m Breaststroke and the 50m Freestyle, plus 4th for 50 back and 6th in 50m fly. Poppy Rix, Honey Pinington-Mclean, Lucy Heron and Evelina Raubaite all put in good swims with Evelina and Lucy trying out their first open meet – Well done girls ! 10 Year old boys – Daniel Simpson who is now a seasoned pro ! took a 3rd for his 100m Backstroke and also did good swims in the 100m IM, 50 Freestyle and 50m Breaststroke. Following lunch he took on the 200m IM and came in 2nd for a silver medal. Lewis Spurr seemed to enjoy his first experience of competing and went home with a bronze medal for his 50m Freestyle, whilst also putting in good swims in the 100m IM and 50m Breaststroke, a 4th position for the 100m breaststroke and finally a 5th placing in the 100m freestyle. Other 10 year old boys competing were, Joseph Parker and Oliver Harvey – both did some good solid swims taking 10th and 6th places in 50m Breaststroke. We had a large group of 12 year old girls doing this meet – Sacha Robb had 3 good placings in the morning session, 4th in 100 IM, gold for her 100 back and a bronze for the 50 Freestyle, plus another gold in her 50m backststroke., silver in the 100m freestyle and lastly 4th in the 50m fly Hannah Mcmillan received a silver in the 50m breaststroke and a bronze in 100m backstroke, plus a 4th placing in the 50m freestyle. Evie Sellers was on top form and gained PB’s in most races – 100m IM 6th, 50m breaststroke 5th, 100m backstroke 7th and 50m freestyle 10th. Maia Bishop did well with Pb’s and placings, 100m IM 7th, 50 and 100m breaststroke 4th and 4th in the 50m backstroke – the 50m and 100m freestyle saw her placed well whilst achieving PB’s. Anya White had a good 50m breaststroke with a PB of 45.32 gaining a 6th place ribbon, she then went on to knock 7 seconds off her 100m breaststroke time and then 2 seconds off the 100m freestyle. Molly Moran who is still quite new to competing did 100m IM, 50m breaststroke, 100m backstroke and 50m freestyle with a great PB of 35.96 – Molly stormed the 50m backstroke with a great PB of 38.52 giving her a 4th place in this event.. Paige Evans who has now settled into the club well, had a great morning of PB’s in 50m breaststroke, she also took 5th place in the 50m freestyle with a new time of 32.71 – Paige also did an impressive 100m fly and for her brave efforts won the gold. The afternoon saw her take a 4th in the gruelling 200m IM and a 4th for the 100m freestyle with a time of 1.12.31, she finished her day off with a bronze for 50m fly– Well done Paige ! Our one and only 13 year old girl, Gabija Raubait took a 5th placing in the 100m backstroke plus a bronze in the 50m freestyle, then after lunch, a bronze in the 100m freestyle and a 4th place for her 50m backstroke. The 12 year old boys included George Wilby who did some great swims and was rewarded with silver for 100m IM and bronze for 50m breaststroke, he also placed well in both his 50m freestyle and 100m backstroke – George swam hard to win a gold in the 200m IM, bronze in both 100m breaststroke and 50m backstroke. James Harvey swam well in both his 100m IM and 50 freestyle with 8th place in both. 13 year old Travis Taylor was on his first outing as an Otter and proudly took silver in the 100m IM and the 50m breaststroke, plus a 5th place, with a time of 31.88, for his 50m freestyle. In the 2nd session Travis took gold for the 100m breaststroke, 5th 50m backstroke and a 6th for the 100m freestyle. Macy Evans was the sole 14 year old Otter and did several good swims which resulted in some good PB’s – well done Macy for flying the flag for the 14 year old girls ! Our 14 and over boys had a great day. Matthew Crabtree taking 4 golds for 50m breaststroke, 50m fly, 50m backstroke and 50m freestyle with a time of 25.66. Connor White took a bronze for 50m breaststroke plus silver in the 100m breastroke, he also gained PB’s in the 100m and 50m freestyle. Aleksander Tokarski (AKA Olek ! ), took bronze in the 100m IM and then a good PB of 28.95 in his 50m freestyle, he also swam well and gained PB’s in his 50m fly and 100m freestyle. Ieuan Blackwell was competing for the first time in a while and took bronze for the 100m backstroke then 7th place in 50m freestyle with a PB of 29.47 – the afternoon session was also a good for Ieuan and he gained PB’s in his 100m freestyle and 50m backstroke. 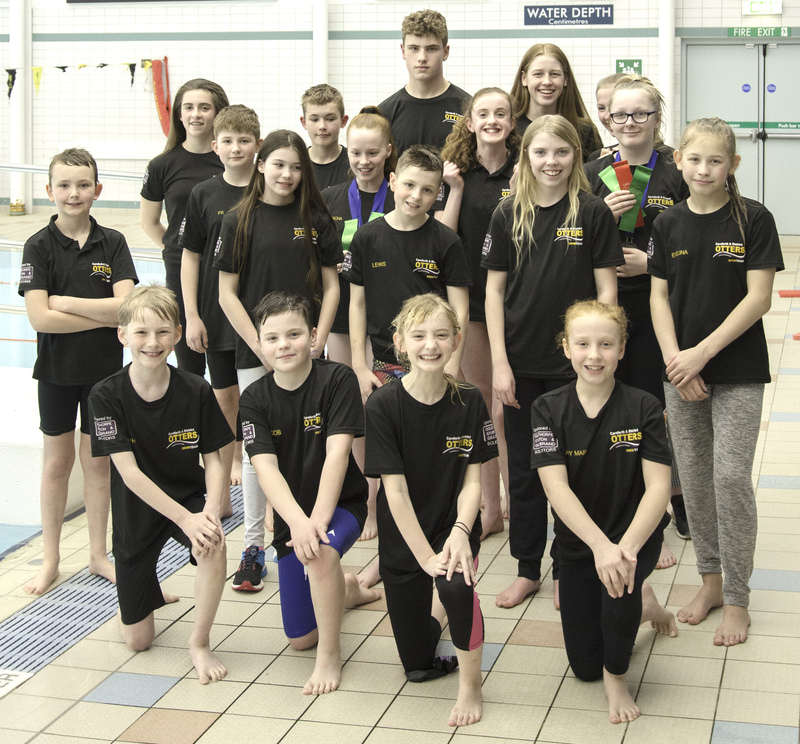 A big well done to all our fabulous swimmers who did themselves and the club very proud – back to training now in prepeartion for our next outing.